Recently, I watched an ad from Flipkart about Debit Card EMI. This sounded a bit strange to me. Typically, you would associate EMI with a credit card or a loan. Getting a credit card is not always easy. Your credit card application can get rejected for various reasons. A bad credit score is a common reason for rejection. Don’t get disappointed. If you don’t own a credit card and would still prefer paying in instalments, you can use your Debit card to make select purchases on EMI. By the way, Debit Card EMI is not a concept launched by Flipkart. Amazon also offers the scheme. This concept has been around for some time. The Flipkart Ad perhaps brought it to limelight or at least to my attention. Let’s find out more about Debit Card EMI schemes. Before we move onto such schemes from Amazon and Flipkart, let’s look at the features of regular debit card EMI schemes of banks. I checked the terms and conditions on ICICI Bank Debit Card EMI page. You need to maintain a fixed deposit or a recurring deposit to avail this facility. Tenure option of 3,6,9,12,18 and 24 months. Interest rate of 13% for tenure up to 1 year and 15% for 18 and 24 months. The maximum limit offered will be up to 90% of the fixed deposit principal value. i.e., you can make a purchase up to 90% of the FD principal value. The EMI tenure should get completed before the FD matures. The purchase amount is first debited from your bank account and subsequently reversed within 2 working days. So, you must have requisite balance for the initial debit. The EMI starts 30 days from the date of reversal. It looks more like a secured personal loan. The security is quite liquid too. #1 In case of debit card EMI, the amount is first debited from your bank account. After a few days, the amount is credited back to your bank account and the transaction is converted into a loan. Therefore, you cannot use your debit card to make a purchase on EMI if your bank account does not have sufficient balance for the purchase. By the way, the same process happens in case of credit card EMIs too. i.e., your credit card is initially charged the complete amount and the purchase amount is converted into an EMI after a few days. However, you wouldn’t face any issue with a credit card so long as your transactions on the card do not breach the credit limit. Please understand, if the bank structures the Debit Card EMI scheme as an over-draft facility, the aforementioned issue won’t be there. Amazon website clearly mentions that your bank account will not be deducted for the purchase amount. Debit card EMI under Amazon works through a pre-approved overdraft facility. I am not very sure about Flipkart. When I checked with the Flipkart executive about the arrangement, she mentioned that the bank account is first debited and subsequently, the purchase amount is converted into EMI. Therefore, you need to have requisite bank balance before you undertake the transaction. #2 No-cost EMI schemes may not be as common in case of debit card EMIs. On the other hand, No cost EMI options are quite common in case of a credit card. However, it is not that banks can’t offer Zero Cost EMI schemes on debit cards. It is more of a business decision. Who Is Eligible for Debit Card EMI Offer? It is not available to everyone. Only select customers are eligible for EMI on debit cards. As I understand, Flipkart/Amazon form the initial shortlist of customers. Subsequently, your bank decides if you are eligible for the debit card EMI. By the way, even for the eligible customers, the scheme is available on select products. Flipkart provides the scheme to select customers with bank accounts with SBI, ICICI, HDFC and Axis. Amazon provides to account holders with ICICI, HDFC Bank and Axis Bank. Select Customers. Select Banks. Select Products. And yes, Select Bank account holders. 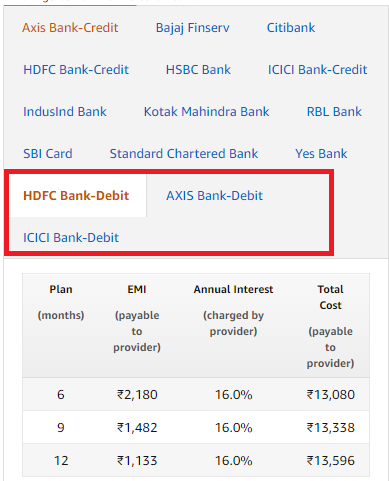 How to Check if You Are Eligible for Debit Card EMI? If you are eligible to make purchases under this scheme, Debit Card EMI option will automatically show on the payments page. Alternatively (in case of Flipkart), you can check your eligibility by sending a SMS DCEMI to 57575. From what I have been given to understand by a Flipkart executive, when you send the SMS, Flipkart can check with your bank about loan eligibility. They check with the bank account linked with your mobile number. If the mobile number (that you used to send SMS) is not updated with the bank account, then you will get a message that you are not eligible. I checked my eligibility. Got a response in the affirmative. How to Use the Debit Card EMI Facility? 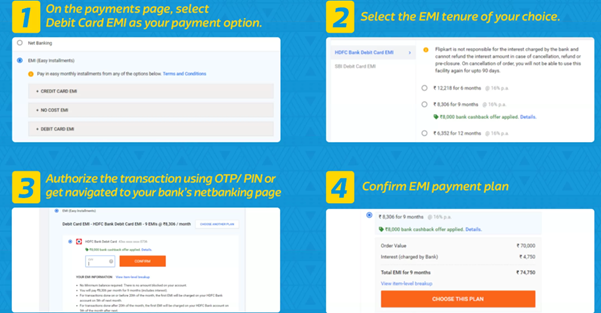 You will get an option to select Debit Card EMI on the payments page. Here is a snapshot of the process from Flipkart website. To check if the product can be purchase under Debit Card EMI scheme, you can check on the products page. Here is a snapshot from Amazon. There is no requirement to maintain a fixed deposit or a recurring deposit to avail this facility (if you are eligible). Please understand this is in sharp contrast to what is mentioned to ICICI Bank Debit Card EMI page. Well, competition can make you relax credit norms. However, the banks have access to your transaction history to take this credit call. There is no processing fee for availing Debit Card EMI scheme on Flipkart and Amazon websites. Other e-commerce websites may have fees. Do check before availing the benefit under the scheme. You can foreclose such a loan if you want. However, do look at the prepayment charges before deciding to square off the loan. The Debit Card EMI scheme is for select customers and select products. Amazon and Flipkart have different minimum purchase amounts for different banks. Should You Opt for Such Schemes? The answer is not too difficult. If you are getting the debit card EMI benefit at 0% percent interest rate (and no other cost), such schemes are quite good. Well, I assume you won’t live beyond your means. If there is cost involved, then you have to see if the extra interest paid is worth it or you can afford to delay the purchase. Disclosure: I have not used Debit Card EMI feature from Flipkart or Amazon. I have relied on information available on the bank and Flipkart/Amazon websites. I also talked to executives from the bank and Flipkart. Some of the information provided by the executives was contradictory to what was mentioned on the websites. Moreover, my experience suggests customer executives do not always understand the complete picture. Therefore, there could be some difference between reality and my understanding. Oct 05, 2018 Bajaj Finserv EMI Card — Should You Get The “No Cost EMI” Card?